The arab Muslims, or precisely the Arab and Non-Arab Muslims in the time of the Messenger of Allah (SAWS) i.e. his companions (among them were Persians, Africans, Europeans) would have rejected the man called Mohammad who came to CHANGE their FALSE beliefs, ARAB customs, basically their “culture” and would have sticked to their “own” Arab religion (which was by then paganism and not the religion of their forefather Ibrahim i.e. Islam). Indeed, the companions of the Messenger of Allah (SAWS) rejected all false religions, starting from their arab religion in their own time, up to corrupted Christianity, Judaism and Majoosism (Zoroastrianism). As Iranian Muslims, calling the baby by its name is not a crime or attack one ones own heritage, for twelver Shi’ism after the Safavids is the most corrupted form of Shi’ism ever, and it is definitely filled with pagan persian elements. Shi’ism started as a supporting group, NOT a seperated sect. It is therefore that Ali Ibn Abi Talib (RA) himself confessed that those who he had disagreed with (in the battles of Siffin, Jamal etc.) are upon the VERY same creed as him. There was the Shia (group, supporters) of Ali and of Mu’awiyah and it was all about ONE difference only (the blood of the assassinated Othman, according to Ali himself). The followers of Ali back then were orthodox Muslims i.e. Sunnah and never seperated from the Muslims in terms of beliefs as the Rafidah Shia extremists have done. That is why one can see that the books of the Sunnah are filled with “Shi’ite” narrators and Shi’ite personalities, for Shia back then only meant the belief of believing in the superiority of Ali over the rest of the Sahaba, THIS was Shi’ism, unlike today were it’s a seperate sect, in fact a seperate religion which changed during the centuries and especially after the Safavids. So rejecting Shi’ism and calling it a Persian (influenced) cult is calling the baby by its name, it is simply saying the truth, just like an Arab would call Abu Jahl a Kafir upon the fake Pagan-Arab religion of the Quraysh, or just like a Pakistani or Indian who would not be ashamed to declare that Qadiyanism (“Ahmadis”) is in fact a sub-indian/Pakistani sect, filled with paganism from this part of the world and emerged from that part of the world. The religion of mankind, i.e. Arabs, Persians, whites, blacks, Indians etc. is Islam, the Islam based on the book of Allah and the Sunnah of his Messenger peace be upon him, and Rafidite-Safavid Shi’ism is a Persian cult, those who seek falsehood and nationalism will always defend the falsehood, no matter how false it is, but those who seek the truth, reject the falsehood, just like the companions of the Messenger who rejected the falshood of their fathers and forefathers for the sake of truth. They call the Sahaba who overrun the Sassanid Empire as uncivilized Bedouins. According to this Shiite al-Ihqaqi, the noble companions who conquered Persia ,the superpower of the time, with zeal and faith were early Bedouins, who worshipped their carnal desires and they spread havoc and destruction. And this is the main reason why many Shiite Iranians have hatred towards Umar ibn al-Khattab because the later overrun the mighty and arrogant Persian Empire. Firstly it makes it clear the Abu Lu’Lu is the spiritual father of the Shiites. Secondly the attribution of “Shujahudeen” shows that the Zoroastrian religion is the real religion for them. 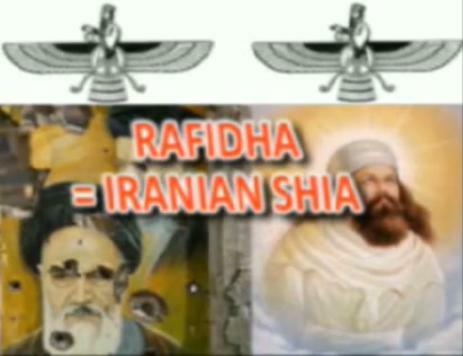 Thus the religion of the Rawafid is a mere Magian sect. One is amazed to see that the Shiites weep over the martyrdom of Imam Hussein(ra) whereas they never weep over the martyrdom of his brother Abu Bakr ibn Ali ibn Abi Talib and over the martyrdom of his son Abu Bakr. Those who bear those names are from the Ahlul Bayt also. Is it because they have names which are disliked by the Rafadhis and by announcing it to their Shiite listeners would expose the love of the Ahlul Bayt to the companions especially to Abu Bakr and Umar? Shiite muhaditeen like Abu Faraj al-Isfahani in his Muqatil at-Talibeen-p.88,142,188; Al-Arbali in his Kashful Ghumamah vol.2,p.64; and Majlisi in Jila el-ou’ioun 582[/COLOR] stated that amongst those who were martyred with Hussein in Karbala were Abu Bakr ibn Ali ibn Abi Talib and Abu Bakr ibn Hussein ibn Ali ibn Abi Talib. Uthman ibn Hussein ibn Ali. Is it because that the likes of Abu Bakr and Umar wiped out the Sassanid arrogance and for this reason mentioning their names are unbearable? Umar was the Faatih (opener) of Persia so naturally Persians (nationalists, i.e. those who preferred nationalism over the truth which is Islam) hated him. Shia hate no one more than they hate Umar and try to place every blame on his head.This hatred is only due to his conquering the Persians. The role of killer of Umar is also a mystery. He was a Persian who Martyred him the way of a suicide killer. So in his robe he wrapped his two-headed dagger, the grip of which was in the middle, and hid himself in a corner of the Medina mosque.] When Umar went to wake up those sleeping in the mosque for morning prayers, Abu Lu’lu’ah leaped upon him and stabbed Umar six times [three times, according to Ibn Sa’d]. He attempted to make his way out of the mosque, slashing at the bystanders [11 men besides ‘Umar, according to Ibn Sa’d] as he fled, but was eventually overpowered. He turned his knife upon himself and committed suicide. .It is not logical that Mauwiyah will order a murder of Hassan who alleged his alliance or atleast signed a pact.According to shias the pact included the clause that khilafat will go to descendants of Ali if hassan died.So Mauwiyah had more than enough reasons to keep Hassan alive. Than there is a strange story that hassan did nothing although he knew his wife is slow poisoning him.All of this is explained if we consider the murder of hassan as the conspiracy of the non-Muslim Persians to make Hussein the next Khalif. Non-Muslim Persians were only interested to make Hussein the khalif as he married a Persian princess Shahrbano.The Persians conspirators and his shias led him to kufa and when their treachery was revealed and imam wanted to return to Yazid they killed him during the night.The only witness to karbala was a slave who was lying due to bribe or fear of his life.It is not logical that Imam will jeopardize his own family to fight a whole army.Also if the army was so savage as to kill an infant,what was stopping them from killing a sick imam Zain? And than the commemorations of karbala in Muharram cannot be for the reason to exhibit their sorrow.People don’t hurt themselves in sorrow.Self flagellation is only done as repentance for some great sin committed.And what can be greater than the sin of killing the Imam and his family? Arabs supported Nestorian christanity in Persia. So their opponents naturally supported the Catholic church.which was against Nestorian. Although modern popes don’t claim infallibility as freedom from sins or mistake, but this was the case at the time of conquest of Persia. . For example, Cyprian of Carthage, writing about 256, put the question this way, “Would the heretics dare to come to the very seat of Peter whence apostolic faith is derived and whither no errors can come?” (Letters 59 , 14). In the fifth century, Augustine succinctly captured the ancient attitude when he remarked, “Rome has spoken; the case is concluded” (Sermons 131, 10Abraham religion emphasize purity of the body but Zoroastrian religion also preached the purity of soul,Fire was the symbol of purification for Zoroastrian Persians. ALL ZOROASTRIANS do undergo the ablution on entering the premises of a fire-temple, to ensure that every religious act they perform is done so in the state of purity of body and soul. The Padyab-Kushti ritual, because it involves the performance of a purification rite, differs from the simple Kushti ceremony, in which a ritually clean person unties and reties the KUSHTI(a thread) without first performing ablutions. This infallibility,purity and taweez was foreign to Islam.These were combined by shias to form the isma theory of infallibility of imams. – the Sassanids claimed to be devine. Today, Shias claim that the Imams were devine with “supernatural powers and universal knowledge”. – the Sassanids were considered “holy” kings, chosen by God to rule the world. Today, Shias believe that the Imams were chosen by God to lead the Islamic community (which is supposed to rule the world). – the Sassanids were fierced enemies of the Khalifs. Especially Omar Ibn Al-Khattab, for under his Caliphate Persia was opened to Islam. The Shias today continue this hate toward the Khalifs, especially against Omar. – in no other Islamic community, “Sayeds” have more authority than in Iran or other parts of the “Iranian world” (Afghanistan, Central Asia) where Shias live. Nevertheless, there are many true Persian muslims that did good work for Islam and muslims such as Bukhari and many good Persian who converted to Islam by their choice . But there were Persians who became muslims and they didn’t want to be true muslims during the time of Omar Cliph. They wanted to just detroy Islam since Islam destroyed their Empire. The ORIGINAL (Tashayyu’) Shi’ism, the ORIGINAL PARTY of Ali, was DEFINITLY the right way (for it was a group of one Sahabi, not a seperated sect, with alien belief). If one studies Islamic history, then it is VERY obvious that Ali was betrayed. This is not about the question of Khalifat, but about Ali himself. There was something about Ali that all others were lacking. However, MODERn Shiism has NOTHING to do with the original movement supporting Ali. Today, it is a mix of ancient Iranian beliefs and Arab politics of 1400 years ago. This entry was posted in films, Majoosi influence on Shi'ism. Bookmark the permalink. How are you gonna say that the islamist shias in Iran are Zoroastrian when in reality the regime in Iran looks down on Persian traditions and history? Have you ever seen an islamist or a mullah celebrating nowruz or charshambe souri? 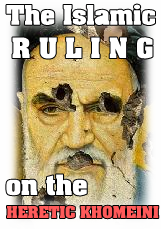 They don’t dare to ban such holidays cause Iranians would decapitate all islamists an mullahs, nothing else. I hope it’s clear now. I even agree with you that the Iranian regime is not every keen on ancient Persian culture, but, nevertheless Shiism (we are talking about a religion not a political gov. only) has many PURELY Zoroastrian elements (and I am not talking about shared bliefs like there is one God) and although the Iranian regime is not very keen on Persian culture (I am putting it your way), yet they are still Majoosi enough to hold grudge against the absolute majority of the Prophet’s (peace be upon him) companions, especially Omar Ibn Al Khattab (may Allah be pleased with him), the extinguisher of the oppressive Sassanid flame.